On April 23, 1516, the region of Bavaria, a region world famous for their wonderful beer, signed on to the Reinheitsgebot, the laws in German and former Holy Roman Empire districts that regulate the ingredients and purity of beer. Although versions of this law were made as early as 1487, the 1516 Bavarian version signed in Ingolstadt is the most famous and influential of the Reinheitsgebot (meaning “purity order”) and was campaigned by Bavaria for adoption across Germany as the various German states unified in the 19th Century. When you look at the distressingly long list of chemicals contained in your soda pop, your energy drinks, your iced coffee drinks, your fruit or vegetable juice beverages and the like, you will be comforted by known that any beer made under the Reinheitsgebot consists of water, hops and barley and nothing else. No preservatives, no phony flavor enhancers, no fake colors, just pure, delicious beer. Critics of the law point out the lack of variety in German beer compared to the incredible diversity found in American craft beers so popular today. Actually, some small exceptions have been made in the Purity Law to allow for other malted grains and at least a bit of diversity, especially for export. Still, it is comforting to know that Germans take their beer seriously enough to make its purity a national issue. Kudos to them! 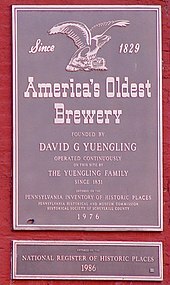 Plaque on the outside of the brewery. Schwedt, Georg. Fünf Jahrhunderte Reinheitsgebot des Bieres 1516: eine historische Biotechnologie des Bieres für Geniesser. Shaker Media, 2016. Next Article April 24, 1184 B.C. : The Fall of Troy!